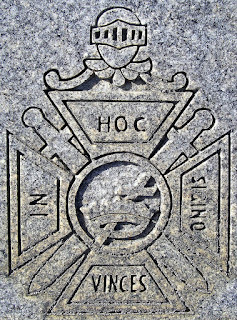 (From March 2010) - I came across this emblem during a recent visit to Evergreen Cemetery in Fitzgerald, Georgia. It is one of the most detailed symbol of the Knights Templar I have seen. At the top is a knight's helmet. 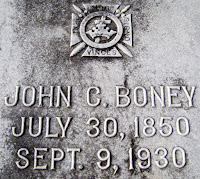 A cross in crown is on top of a Maltese cross with crossed swords behind it. 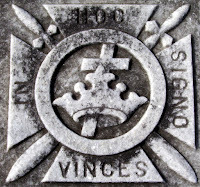 Included is the motto In Hoc Signo Vinces, a Latin rendition of a Greek phrase meaning "in this you will conquer."